Disputed Territory aims to elaborate on the activities of and express solidarity with farmers who are resolutely, and in some cases for the first time, seeking justice regarding their land. To exhibit current challenges and bring into focus some of the key obstacles in the Mon context, this report uses case studies of appeals over past military land confiscations in Ye Township and on-going transgressions by various investors in Kyaikmayaw Township. Where barriers to justice exist, HURFOM recommends effective and immediate solutions. The argument presented herein is simple. Since 2011 farmers have been actively pursuing their rights to land, yet to date little progress has been made. Few past victims of unjust land acquisition have had land returned, misconduct by investors in land acquisition continues, and secure land rights remain virtually absent from Burmese law. Given the focus on farmers’ struggle for their rights, this report pays considerable attention to the legal framework in which past and on-going land disputes have taken place. Inadequate legislation and public lack of awareness of existing legal rights are highlighted as key reasons why Mon farmers do not possess rights to their land in 2013. In a nation emerging from conflict and actively pursuing economic development, farmers are in desperate need of robust, legally enshrined protection of their land rights. ince 1995 HURFOM has been engaged in documenting the voices of Mon populations with research methodology that was developed over these 18 years of experience. After preliminary visits it was decided that field reporters would focus on Ye and Kyaikmayaw townships because cases there reflected the spectrum of different perpetrators against whom Mon farmers are appealing unjust land acquisition: military in the former and various companies in the latter. Ye and Kyaikmayaw were also determined to be better suited to collecting comprehensive data than other regions; in Thanbyuzayat and Yebyu townships victims of confiscation had more consistently migrated to neighbouring countries for work opportunities. Field reporters made use of an extensive network to facilitate interviews and gain the confidence of victims. On our reporters’ fourth and final trip to Ye Township, a local religious leader provided assistance that was invaluable to our work. In total close to 100 interviews were conducted. 83 local residents were consulted in Ye and Kyaikmayaw townships and seven in Yebyu Township. In Ye Township 14 villages were covered, whilst testimony was obtained from residents of five Kyaikmayaw villages. In addition, field reporters consulted four members of the Settlement and Land Records Department, two parliamentary representatives (both members of the Land Investigation Commission), five members of village administration, one Union leader and numerous legal experts. Where possible HURFOM uses the real names of interviewees, although many requested to remain anonymous or to appear under an alias given security concerns related to their cases. Similarly, for protection of interviewees and at their request, in some cases their precise locations are not listed. Over the course of this research, various persons declined to talk with HURFOM reporters. Some victims of military confiscations in Ye Township expressed distrust for our reporters, saying they would only cooperate with political parties. Of 12 civil servants who declined interviews, two said they were concerned about farmers’ rights in on-gong land disputes but feared that giving testimony might jeopardise their positions. All companies active in Kyaikmayaw Township refused requests for information. In addition to conducting interviews, HURFOM was able to obtain copies of correspondence regarding land disputes in Ye, Kyaikmayaw, Yebyu, and Thanbyuzayat townships. These contained both original letters of appeal from residents and responses by government personnel. Where possible, cases represented here are given in the fullest and most accurate detail possible, with hopes that the information gathered in this report may be used as an advocacy tool for advancing the cases of the victims. Appendix 2 contains a list of confirmed cases of military land confiscation in Ye Township, all of which remain unresolved. This register was made by crosschecking a list of victims in Ye compiled from HURFOM’s archives with new information obtained during this year’s interviews. Whilst the original list was too extensive for all cases to be followed up directly during our data collection period, in each village reporters invited a handful of interviewees to the local monastery to discuss their and others’ cases. In addition to new materials collected, this report includes information, testimonies and images from HURFOM’s extensive archives. It also draws on the growing number of news articles and research documents available surrounding land conflict and rights in Burma, supplemented by original pieces of land rights legislation. As far as possible, HURFOM aimed to analyse research collected in Mon regions in the context of wider land rights issues throughout Burma. and confiscations under military rule were supported by a domestic legal framework that flouted international norms (see Appendix 1) and in which land could be seized from owners within the parameters of the law. By the time Ne Win’s military government took power in 1962 legally defined land rights in Burma, also known as Myanmar, had seen significant decline. British colonial rule had recognised private ownership of land and, whilst land could legally be acquired by the State for public purposes, in this period landowners enjoyed various rights over the use and transfer of their land. However, when Burma gained independence from British rule and moved to a model of socialist governance, private land rights were replaced by a system in which the State formally owned and could exert claims over the country’s land. The 1947 Constitution, adopted immediately prior to 1948 independence from British colonial rule, formally designated the State as the ultimate owner of all land. This was followed by the 1953 Land Nationalisation Act that, with the exception of smaller plots of land (up to 50 acres) that farmers could prove they had owned since 1948, brought all agricultural land subject to State reclamation and redistribution schemes. The aim of this legislation was to protect smallholder farming and reverse large-scale acquisitions that had taken place in the post-independence period, but it set a precedent for the State wielding constitutionally defined ownership rights and legally seizing land. Even before the 1962 military coup the way was paved for widespread land confiscation. With a legal basis for land confiscation already in place, successive military governments reaffirmed, enhanced, and increasingly exercised the State’s legal ownership of the country’s land. Shortly after Ne Win seized power the 1963 Disposal of Tenancies Act was passed, deepening State control over land by establishing the State’s right to terminate landlords’ tenancy arrangements and initiate its own. Furthermore, both the 1974 and 2008 Constitutions reiterated that the State was the ultimate owner of all land. As military demands for land arose and confiscations proliferated, the justification that the State was acting in accordance with rights conferred to it by the country’s law was repeatedly employed. One of the most prominent types of land confiscation in Mon areas under military rule was the seizure of civilian land by military battalions. Where compensation was paid it was described as negligible, and most victims reported receiving none at all. In Mon regions land confiscation by the military is recorded as most prolific after 1995. Prior to that year the regime was still waging war against a number of the country’s ethnic minority populations and large regions of Mon territory were held under the direct control of the New Mon State Party (NMSP), the predominant ethnic Mon resistance group. However, the 1995 ceasefire between the NMSP and Burmese military forces returned many of these areas to governmental administration. As the military sought to exert its control and counter renewed insurgencies, increasing numbers of troops were deployed to this newly accessible territory. These battalions began to build bases, often employing forcible confiscation to meet their growing land needs. To make matters worse, in 1997 government funding for military activities was severely depleted and battalions were ordered to follow a policy of ‘self-reliance’. Battalions’ demands for land outgrew just housing and acreage for bases to include the need for farming projects that supplied food and income to cover operating costs. As the rising number of military units based in Mon areas attempted to better meet their own needs, land confiscations gathered pace. Troop deployments to Mon areas and resulting land confiscations further intensified when preparations began in 1998 for the construction of the government-owned Kanbauk to Myaing Kalay pipeline. Running from Tenasserim Region to Karen State, the 183-mile-long pipeline was to travel the length of Mon State through five different townships. With military forces tasked with its construction, security and maintenance, by 2003 over 20 new battalions had been deployed along the pipeline’s route. In a report published in 2009, HURFOM stated that pipeline battalions had seized approximately 12,000 acres of land in addition to the 2,400 acres confiscated by the State to clear a path for the project. A large number of these land confiscation cases were concentrated in Mon State’s Ye Township and are detailed in Section E.
In addition to land acquisition by battalions, under military rule Mon farmers routinely experienced land confiscation by village administrators. In some cases this was carried out in response to orders from above dictating confiscation on behalf of the military or for State projects, but on other occasions administrators took advantage of the government’s tolerance of local-level corruption and seized land for personal gain. Since 2011 when political and civil space began to open for farmers to lodge appeals regarding military-era confiscations, new cases have come to light (see Section D). For example, from 2011-12 farmers from Thanbyuzayat Township sent two successive letters of appeal to State authorities detailing confiscations in their home village of Kayokepi in 2008. The letters alleged that the village’s administrator, U Cartoon, had seized 19 acres of land from five farmers, splitting it into small plots and selling it for profit. 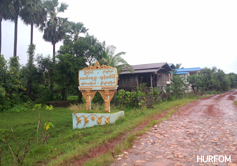 An investigation in 2011 by the Thanbyuzayat Township General Administration Department concluded that the Kayokepi land had been confiscated following orders from a Light Infantry Battalion (LIB) General and that its sale was intended to raise funds for the construction of a road between Kayokepi and Htin Shu villages. The road was indeed subsequently built, but U Cartoon has since proved unable to provide a detailed account of how the money was spent. Whether or not the funds were wholly used for the road’s construction, the case demonstrates the common theme of a lack of transparency. Similarly, HURFOM documented this year that 201 acres of land were allegedly confiscated in late February 2011 from residents of Kaloh village in Ye Township by sub-Township Administrator U Kyaw Moe and village administrative staff. Like the Thanbyuzayat case, land was split into small plots and sold off. Villagers were told that the resulting profit would be invested in community development, but they allege this promise never materialized in any visible way. Given the lack of transparency, residents were left to assume that village administrators personally profited from the sale. Despite the inauguration of a nominally civilian government in March 2011, unjust land acquisition has remained a recurring theme for Burma’s rural and agrarian populations. 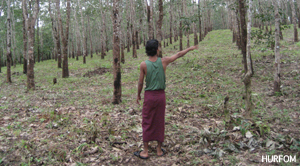 Almost a quarter of the human rights violations recorded by the Network for Human Rights Documentation – Burma (ND-Burma) from April to September 2012 consisted of land confiscation cases that reached across seven different states and the group called land confiscation “one of the most pressing issues of 2012”. Since 2011 reports have continued to emerge of military land confiscations in Mon regions. In June 2011 HURFOM reported on land confiscations by Navy Unit No. 43 on Kywe Thone Nyi Ma Island in Tenasserim Region’s Yebyu Township. Although confiscations began in December 2010 prior to Thein Sein’s presidency, they continued into the new government’s term. At the time of the 2011 report 1,000 acres of land had already been seized, reportedly with no compensation paid, and a further 3,000 acres of land were designated for acquisition by the navy unit. A communication from Secretary Myo Aung Htay on behalf of the President in August 2011 detailed that 81,196.62 acres of land in the area had been transferred to the navy unit. 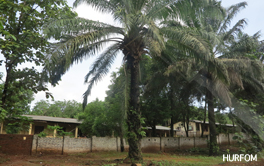 Although the letter held that at the time of seizure none of the land was being cultivated or used and was therefore rightfully acquired, testimonies collected by HURFOM earlier that year disprove this claim and suggest that at least some portion was unjustly confiscated from residents. With President Thein Sein’s administration heralding its emphasis on democratic reform, one of its central priorities since 2011 has been an end to conflict between Burmese military forces and the country’s numerous ethnic armed groups. However, over the course of negotiations reports have emerged of farmers becoming unwitting victims of the peace process. Allegedly, in some cases land has been used as a bargaining tool to appease armed groups or as a means to incite division between the ethnic populations they represent. In May 2013 residents from 14 villages in Paung Township of Mon State protested against on-going injustices in their communities. One major complaint surrounded a conflict over 3,000 acres of land in Zin village marked for confiscation by the NMSP to be used in an NMSP agricultural project. Nai Tala Nyi, an NMSP representative, detailed that since 2004 the group had sought permission from the government to appropriate this land. The permission was finally granted when the NMSP signed a ceasefire with the government in 2012. Whilst the NMSP stated that no land would be confiscated if farmers could prove ownership and that around half of the chosen land was too mountainous to be cultivated, the case highlights the impact of negotiations between government and ethnic actors on farmers’ land security. With numerous armed factions operating in Mon areas, the NMSP has not been the only group involved in land conflicts during the recent peace process. 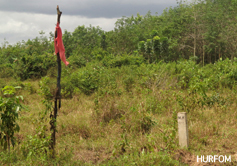 In July 2013 HURFOM published a case study detailing land confiscated in Kha Yone Guu of Kyaikmayaw Township by the Mon Peace Process group, also known as the Nai Syoun group, which is a breakaway from the NMSP. Having allegedly built good relations with the Burmese military by selling them illegally imported arms, in 2012 the group was granted permission to deploy troops to Kha Yone Guu and immediately sought land to build a base. Cases of confiscation reportedly included villagers who could present ownership papers for their land and residents who were threatened at gunpoint or otherwise intimidated into handing over high value land for minimal compensation. One Kha Yone Guu resident expressed his belief that the government had permitted the confiscations to turn Kha Yone Guu’s Mon residents against the armed group. In addition to curbing ethnic conflict, another stated priority of President Thein Sein’s administration has been to significantly advance Burma’s economy. However, it is of concern to HURFOM that pursuit of this goal appears to have generated a wave of unjust land acquisitions throughout the country, including in Mon populated areas. Several land conflicts occurring after 2011 reportedly involved misconduct by domestic and foreign investors as they scramble to acquire vast tracts of land for development projects. For the most part this is not a new trend; since the State Law and Order Restoration Council (SLORC) moved away from Socialism in 1988 and towards a market economy, disputes over companies’ land acquisitions have routinely arisen. The 1991 ‘Wasteland Instructions Law’ that sanctioned granting companies up to 5,000 acres of terrain classified as ‘wasteland’ for leases of up to 30 years, in many ways opened the door for this. However, since 2011 such cases have been occurring at a rapid rate. Land prices in Burma are soaring and show no immediate signs of reversal, and investors have attempted to grab plots of land while they can at a comparatively low expense. For foreign investors, the 2010 elections and subsequent relaxation of Western economic sanctions provided the impetus to initiate projects within an emerging economy. Later sections of this report detail how 2012 laws privileged new investors’ interests, leaving farmers’ land rights largely unprotected in the process. In Mon territory the most serious infractions have occurred in Mon State’s Kyaikmayaw Township, with land unjustly acquired from residents by various domestic companies planning to establish extensive cement production in the region (this case is discussed in full in Section F). With plans recently announced in Moulmein, the capital of Mon State, of a USD 386 million cement plant by Thailand-based Siam Cement Group and designs for an electric power plant run by another Thai-based company, potential risks to farmers’ land security in the region continue to arise. Ko Than Hlaing, a senior construction engineer originally from Moulmein, emphasised the importance of community members being able to share in the benefits of investment rather than solely bearing the costs. Compounding the threat to farmers’ land rights is the spate of State-backed development projects brought on by new investment designed to improve the country’s infrastructure as it seeks legitimacy in global markets. In June 2013 HURFOM reported on destruction of land along the route of a road construction project planned to link Mon State’s Thanbyuzayat Township to Thailand via the border town of Three Pagodas Pass. With 280 acres of land destroyed since the project commenced in 2011, sources allege that on 7 June 2013 Col. Aung Lwin, Border Security Affairs Minister, commanded the chief engineer of the Public Construction Department to focus singlehandedly on the road’s construction, even where this was at the expense of residents’ land. In 2012 various land laws were repealed and a number of new laws were passed concerning farmers’ rights to land and the acquisition of land by other agents. Below is an overview of some of the key laws in effect at the time of writing. The contention is that these new laws have been used to (1) vindicate past land confiscations, thus avoiding land restitution and compensation payments, (2) deny the rights of farmers in on-going land conflicts, and (3) facilitate future unfair acquisitions of farmers’ land. 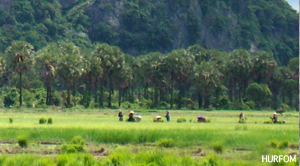 The 2008 Constitution declares Burma to be a market economy in which private property rights are recognised (Articles 35 and 37) and requires the government to enact necessary laws to protect peasants’ rights (Article 23). However, the 2008 Constitution maintains the State as the ultimate owner of all land (Article 37) and thereby preserves the government’s right to forcibly acquire land from its citizens. Agricultural projects must be carried out as a joint venture with a citizen (Article 35). Foreign investors can lease land for up to 50 years, which can be extended up to a total of 70 years (Article 31). carried out by citizens (Article 4). However, the Myanmar Investment Commission (MIC), a body appointed by the government to oversee foreign investment (Article 11), is given considerable authority to overrule these regulations. Notably, it may allow restricted investments for “the interest of the Union” (Article 5) and stipulate longer land leases in less developed, difficult to access areas (Article 36). The Farmland Act was passed on 30 March 2012 and came into force on 31 August 2012 with a set of accompanying regulations. The law upholds the State as the owner of all land but permits the “right for farming” to individuals in order that the country’s agricultural production may develop (Article 3). Disposing with socialist-era legislation, the act formalises the 2008 Constitution’s commitment to a market economy, putting in place a system of private land ownership where citizens and other bodies may legally own, sell and otherwise transfer land. By this law, the right to use farmland is recognised when land is formally registered in the owner’s name, notably excluding rights to land conferred by informal customary ownership practices (Article 4). Land use rights are to be managed by Farmland Management Bodies (FMBs) at Village/Ward, Township, State and Central levels, and registered by the Settlement and Land Records Department (SLRD). Individuals with claims to land must apply to their Township’s SLRD for a Land Use Certificate (LUC) and pay a fee to register their land should the SLRD decide in their favour (Articles 5-8). The use of land only for the purpose specified in its LUC, unless permission is granted from the relevant FMB. Farmers are prohibited from growing anything other than their regular crop or using their land for non-agricultural purposes. An obligation to cultivate land at all times, refraining from leaving it fallow without sound reason. 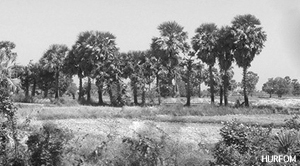 Further jeopardising farmers’ land security, State ministries reserve the right to utilize farmland for projects in the long-term interest of the State (Article 29), although compensation must be paid (Article 26) and land returned if the project is terminated or not carried out within the prescribed timeframe (Article 32). Whilst compulsory sale of land is a rights-respecting feature of law in many countries there are serious concerns in Burma’s case, given a precedent of State abuse of the legally enshrined right to appropriate land. This is compounded by the fact that the law lacks clear guidance on when and for what reasons the State may demand sale of land, and on how compensation is to be decided. The Farmland Act does permit “agriculturalists associations” (Article 38). However, there is no mechanism to refer land appeals to an independent judicial body (Articles 22-25). Instead, village/ward FMBs are designated as responsible for deciding land disputes, with appeals to be lodged first with the Township FMB, then the District and finally the State FMB that holds ultimate decision-making power. Land may be acquired by citizens, joint-venture investors (by approval of the MIC) or government bodies for the purposes of agriculture, mining or other government allowable purposes (Articles 4-5). Up to 5,000 acres of land may be granted at any one time, up to a maximum of 50,000 acres (Article 10). Lease periods of up to 30 years are allowed (Article 11). Decisions to grant land are made by the Central Committee for the Management of Vacant, Fallow and Virgin Land chaired by the Minister for Agriculture and following recommendations from various government bodies (Articles 6-7). Powers conferred on the Central Committee include the right to grant more than 5,000 acres of land for projects in line with State interests (Article 10). In conjunction with the Farmland Act the VFV Law designates the right for investors to acquire any land not formally registered with a LUC, superseding claims to land conferred by customary ownership practices. Whilst the law acknowledges that farmers may in fact be cultivating formally unregistered areas of land (Article 25), where they lack official documentation their rights are left unrecognised. If LUCs are not held then compensation need not be paid to cultivators, nor must their consent to acquisition be obtained. Farmers are offered limited legal recourse to protest such acquisitions. Again no independent judicial body is assigned to handle disputes, with the Central Committee given responsibility for handling contested cases (Article 25). Offering some protection, the accompanying VFV Rules stipulate that the Central Committee must ensure that farmers cultivating unregistered land are not unjustly dealt with (Rule 52). However, the VFV law makes clear that protest is subject to severe legal consequences: individuals protesting against land acquisition by interfering with the concerned project’s progress are liable to penalties of up to 3 years imprisonment or a 1 million kyat fine (Articles 26-28). It is worth noting that concerns over land security under the VFV Law are applicable to land owned by the vast majority of Burma’s farming population. In June 2013 it was claimed that 85% of farmers in the country lacked currently valid paperwork for their land. Reports have indicated few government efforts to facilitate swift land registration and there is a pressing need for the registration process to be streamlined and accessible to farmers looking to obtain LUCs. Although HURFOM’s research shows that this observation is all too true, another trend has encouragingly emerged alongside it. With almost equal frequency, news outfits have been reporting on farmers taking action against unjust land acquisition. Encouraged by President Thein Sein’s nominally civilian government and making use of new freedoms granted by its reforms, farmers across Burma have been taking a stand against unjust land acquisition by demanding restitution for past confiscations, calling for fair treatment in on-going land disputes, and moving to secure rights over their land in the future. Research confirmed Mon farmers’ participation in this surge of civil action. Information obtained from Ye and Kyaikmayaw townships from April to September 2013 is summarised below, alongside research from this period and HURFOM archive materials regarding Thanbyuzayat, Paung and Yebyu townships and other areas of Tenasserim Region. Case studies in Sections E and F expound in full on residents’ activities in Ye and Kyaikmayaw townships. Several farmers seeking restitution deemed fair compensation at the land’s current market value to be an acceptable alternative where land is currently in use by its new owners and return is impractical. Other farmers lodged more modest requests. One farmer from Kyaung Ywa in Ye Township said residents from his village had given up altogether on hopes of restitution for land confiscated from them in 2001 by Light Infantry Battalion (LIB) No. 591. Instead, they were appealing to be compensated only for the plants growing on their land at the time of its seizure. The most common activity reported by Mon farmers when tackling cases of unjust land acquisition was penning letters of appeal. Written appeals were recorded in Mon State’s Ye, Kyaikmayaw and Thanbyuzayat townships, in addition to Yebyu Township and other areas of Tenasserim Region. These were variously directed to the President, government departments, senior military authorities, local administration, parliamentary representatives and the recently established Land Inquiry Commission (see below). Letters illuminated the range of abuses and perpetrators, from past to on-going land acquisitions and involving the military, local administration, investors and ethnic armed groups. Several farmers were recorded as having defied the authority of unjust land acquisitions. Nai Tun Toung, 54, from Mae Gro village of Kyaikmayaw Township told a story that echoed narratives shared by a number of farmers who said they cultivated crops or built structures on land that had been unjustly taken from them but then never subsequently used. Correspondingly, a farmer from Kaloh village, Ye Township explained how in February 2012 he built a fence around land that was confiscated from him in 1992 for railway line construction but was never used for that purpose. In a similar act of defiance, residents of Ye Township’s Tu Myoung village refused in June 2012 to pay an annual tax levied by the military in exchange for permission to work on land confiscated by LIB No. 586 in 2001. Various farmers who experienced investors’ attempts at unjust land acquisition told HURFOM that they, or others in their village, declined unsatisfactory offers of compensation even when company officials used threats to coerce the owners into signing compensation agreements. Nai Tun Kyi, a 55-year old farmer from Mae Gro village in Kyaikmayaw Township, detailed his refusal to cooperate with the June Industry Co. Ltd. in 2011. Ma Thin, 36, from Kyaikmayaw’s Ka Don Si village described repeated refusals to hand over her land to the Pacific Link Company. Nai Kao Tala Rot spoke to HURFOM about the formation of the Rehmonnya Agriculture and Farmers Union (RAFU) designed to represent Mon people living in Mon State, Karen State and Tenasserim Region. An ex-NMSP member, Nai Kao Tala Rot founded the Rehmonnya Labour Union (RLU) in 2009 and more recently accepted an offer from RAFU’s founder Nai Ron Dein to impart his experience to the establishment of the RAFU. The Union is in the process of official registration, with an application currently under consideration by township-level authorities. In addition to responding to cases of land conflict, Nai Kao Tala Rot detailed that the RAFU offers training for farmers covering land rights and land registration processes amongst other topics. Trainings have been given in Kyaikmayaw, Moulmein and Chaung Zone townships, with plans to begin activities Ye and Yebyu townships. Some appeals lodged by Mon farmers were directed to and investigated by the newly formed Land Investigation Commission, established in June 2012 in response to disquiet amongst the nation’s famers. Passed with 395 votes in its favour, the commission had the backing of broad parliamentary support. The Land Investigation Commission is divided into nine groups composed of parliamentary representatives and tasked with investigating disputed land acquisitions since 1988 in specific regions. Notably, its mandate is limited to investigating cases and formulating recommendations and does not include or bestow decision-making capabilities. Mon farmers’ complaints fall under the jurisdiction of Group 9, or the “Land Grab Inquiry Commission”, responsible for investigating disputes in Tenasserim Region and Karen and Mon states. The five-person group is led by U Htay Lwin, a member of the Upper House of Parliament, along with four Lower House MPs representing the different constituencies covered under the Commission’s authority. 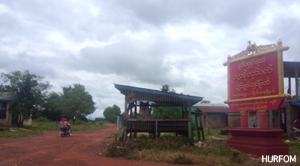 The group began field research activities in late September 2012 with tours of various areas in Karen State. Given that investigations in Mon State commenced only in June of this year, results have yet to be seen. For Mon areas, the nascent activities of the Land Grab Inquiry Commission Group 9 signal a step in the right direction, and HURFOM acknowledges the enormous task at hand and the significance of burgeoning efforts to collect and respond to farmers’ appeals. It is hoped that this report will serve as a research and advocacy tool to assist with these land survey endeavours and provide recent, supplementary data from Ye and Kyaikmayaw townships. Most cases presented herein occurred after 2005 and up until today and therefore suitably match the Commission’s mandate to cover land disputes originating after 1988. However, there are some clear reasons, outlined below, to doubt that the Land Investigation Commission represents a convincing attempt on the government’s part to improve processes and inadequacies currently inherent in land dispute resolution. Members of the Land Grab Inquiry Commission detailed various obstacles faced during the course of their inquiries. For example, MP Mi Myint Than described the failures to cooperate with investigations exhibited by senior military authorities. Commission Member Daw Nan Say Awa, who also serves as the MP for the Phalon-Sawaw Democratic Party for Hpa-an Constituency, Karen State, reported that members of the Settlement and Land Records Department (SLRD) had failed to respond to requests from the group for assistance to investigations. 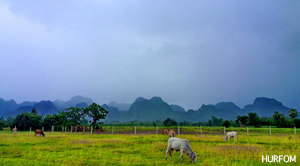 Another obstacle was apparent during field surveys in Hpa-an Township, Karen State where the group’s investigations were hindered by farmers’ fear of reprisals from authorities involved in land confiscation. Mi Myint Than commended the efforts of other villagers, unaffected themselves by land disputes, who disregarded threats from village administrators and bravely assisted the Commission by encouraging hesitant farmers to discuss their cases. Still, apprehension surrounding frank discussions of land disputes represents a substantial challenge to the Commission’s investigations as it pursues comprehensive and accurate data collection. Land Grab Inquiry Commission members interviewed by HURFOM displayed a genuine commitment to helping farmers pursue their rights to land. Speaking to HURFOM, Mi Myint Than emphasised the Commission’s freedom from government control and the impartiality of its members. However, the potential of the Commission to influence outcomes is limited and the group’s mandate is purely investigatory in nature. This sentiment was supported by events following the Land Investigation Commission’s first report to parliament in March 2013 concerning military land seizures. The response was directed to the Land Investigation Commission as a whole, but has important implications for activities in Mon areas. It was reported that between July 2012 and January 2013 the Land Investigation Commission received 565 separate complaints regarding military confiscations covering almost 250,000 acres of land. However, on 16 July 2013 Burma’s Minister of Defence announced to parliament that only 18,364 acres of land reported on by the Commission would be returned to owners. He asserted that the remainder could not be returned as it was in use by military battalions or was too close to active military space to be safely used by civilians. He also claimed that a number of complaints listed by the Commission had been perpetrated by other actors and unfairly blamed on the army. In Section C, HURFOM noted concerns that local and national-level corruption will continue to impinge upon justice and dispute resolution until laws provide for land acquisition cases to be investigated and decided by independent decision-making bodies. The government communication above evidences that without direct dispute resolution authority, the Land Investigation Commission’s efforts may remain toothless. The Land Investigation Commission is also unable to expedite restitution of land or payment of compensation following the announcement of decided outcomes. Those farmers mentioned above and representing the small fraction of land designated for return by the military have yet to regain their farms and plantations. Despite hopes that land would be restored to former owners before the end of fertile monsoon season, no immediate actions were taken. Burma’s Union Parliament Speaker Thura Shwe Mann and Land Investigation Commission Member MP Pe Than were among the critics of the slow-moving land restitution process. Whilst the Minister of Defence had initially promised that land would be returned in July of this year, on 23 August Presidential Office Minister U Soe Thein announced that land would be returned to farmers in October and contingent upon their ability to produce LUCs. On the whole research showed that farmers’ vocal pursuit of their land rights has been met with little real progress. As detailed above, few cases of land disputes in Mon regions have been brought to satisfactory and just conclusions and most are accompanied by concerns about the methods of handling complaints. On a nationwide scale, the Land Investigation Commission’s limited impact showcases its restricted capacity to influence decisions that, instead, frequently remain in the hands of local, military, or state authorities that were themselves complicit in the disputes. President Thein Sein promised to develop “clear, fair and open land policies”, but his commitment to reform continues to be questioned. For example, the newly drafted Farmers’ Interests Promotion Bill remains silent on the issue of unjust land acquisition. Current legislation still leaves the door open for investors to obtain vast areas of land from farmers whose rights are legally undefended. Worryingly, reports have also emerged of the country’s law being applied to arrest activists staging protests over land disputes. The question arises: what exactly is standing in the way of progress? 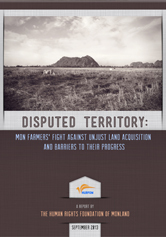 The following sections explore some of these barriers using land dispute case studies from two different townships to analyse the obstacles Mon farmers’ face in their pursuit of just land rights. HURFOM stands alongside these courageous Mon farmers and calls for reforms to facilitate immediate and equitable recognition of their rights to land. As outlined earlier in the report, under military rule various factors conspired to bring about large-scale military confiscations of land in Ye Township, located in the south of Mon State. These confiscations largely took place after 1995 following the ceasefire between NMSP and Burmese military forces. As a zone newly accessible to the Burmese military and on the route of the Kanbauk to Myaing Kalay gas pipeline, Ye Township saw a surge of military battalions deployed to the area and subsequently seeking land. Victims of previous Ye military confiscations were revisited by HURFOM in 2013 and each reported losing between 2 and 40 acres of land with little or no compensation provided (see Appendix 2). Sums of compensation recorded were as low as 563 kyat for almost seven acres of land. Often the fact that land was unregistered and officially classed as ‘vacant’ was used to justify failure to compensate land or the crops growing on it. From July to August 2013 HURFOM field reporters revisited victims of previously reported cases of military land confiscation in 14 villages in Ye Township and some in Lamine and Ye towns. In five of those villages a large number of previously reported cases were no longer being disputed, whilst in another five various difficulties meant that little reliable data could be obtained. Hence 105 on-going land dispute cases were confirmed in the surveyed areas and followed-up by HURFOM researchers (see Appendix 2). In general, the confiscations under discussion took place in 2001 and research revealed the spectrum of farmers’ experiences in Ye Township over the 12 years following the loss of their land. After their land was confiscated, the majority of farmers continued to work on their properties for at least some period of time due to tenancy agreements with the land’s new military owners. In all villages surveyed, offers of tenancy agreements had been made to residents. However, a letter of appeal noted that offers had not been made to farmers whose land had been classified as fallow. Interviewees in Ayu Taung village suspected that the military had made different offers to different parties in order to create disunity amongst villagers and prevent them from uniting in collective protest. In many cases farmers were given permission to work on land for three to five years without incurring fees, particularly where they had received no compensation at the time of seizure. However, in Koe Mile village farmers noted that the rent-free period officially granted to them was five years but, for two of these years, they were prevented from using their land. “After the five years [rent-free period] we had to pay 550 kyat per rubber tree [growing on the plantation], 700 kyat per tree the following year, 800 kyat the next, and eventually 1,300 kyat”. With few other options to earn an income, many villagers agreed to the rental arrangements. Some continue to pay usage fees on their former plantations to this day. However, numerous interviewees said that they had been unable to afford the payments demanded and so could not rent their land. 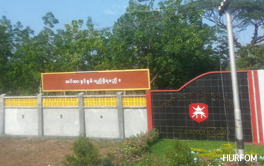 Where this was the case in Kyonepaw and Kyaung Ywa villages, it was reported that businessmen from other areas had subsequently taken up rental contracts on villagers’ farms. In a third case, corruption amongst military authorities led to a villager having to pay rental fees again and again to multiple agents. In other cases, land had been rented out to companies whose lack of expertise in farming had caused the destruction of land and plants. Overuse of chemicals by inexperienced cultivators was given as one cause of this decline. For farmers in Ye Township who either refused to pay usage fees, had rental contracts terminated, or were never given the option to continue working their plantations for a cost, land seizures resulted in a damaging blow to their livelihoods. Some were fortunate enough to own multiple plantations to offset the loss of one, but for others their single plots of land represented their sole source of income. 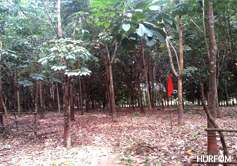 In addition, with up to eight years of continuous investment and labour needed to see a profit from rubber trees, one of the primary crops in Ye Township, the loss of plants for little or no compensation created a further affront to the farmers’ years of effort. However, several farmers were reported to have migrated to other parts of the country or Thailand to seek work due to shortages of work opportunities in their native communities. Despite various testimonies collected about the loss of livelihoods, HURFOM research suggests that it is likely that the full extent of hardship faced by many families in Ye Township following confiscations remains undocumented. Field reporters described a recurring sense that some interviewees were too embarrassed to admit the full scope of financial difficulties that befell following their loss of land. Many farmers expressed a deep attachment to their land and, as a result, a heavy emotional toll associated with its loss. Nai Hlaing, 70, from Kyonepaw village told HURFOM that despite refusing to rent his plantation from its new military owners, he helped them put out a fire on the land. In 2012 a farmer in Chapon village told HURFOM that the connection he felt to his land had prevented him from migrating for work, despite the fact that the little land left to him after confiscation was not sufficient to support his family. After years of hardship faced by farmers in Ye Township, the advent of President Thein Sein’s nominally civilian government and the end of decades of direct military rule ushered in a wave of public demands for rights over confiscated land. The initiation of democratic reform in 2011 was not the first catalyst for farmers in Ye Township to speak out against land seizures, but complaints began to be heard at a hitherto unprecedented frequency. Over the past few years, former residents of Chapon village began trickling back home in search of land restitution after being displaced by confiscations perpetrated by Navy Unit No. 43. 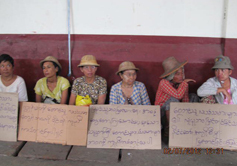 Farmers in Tumyoung village refused to pay annual rental fees to Light Infantry Battalion (LIB) No. 586, instead demanding the return of their land. Formal letters of appeal were sent by residents in villages throughout Ye Township to the government and members of parliament. By various means, the victims of past land confiscations began to make their voices heard. by residents] can be solved. Therefore we, the residents, have written this letter of appeal to be submitted to the authorities and other departments.”The letter was written on behalf of all victims of military confiscations in the region, many of whom it said were unaware of their legal rights regarding land taken from them. It demanded that: (1) authorities account for all military land confiscations in the region and justify them by law, (2) land involved in unjustifiable seizures be returned to residents, and (3) in the remainder of cases compensation be paid for crops growing on the land at time of seizure. The letter called for assistance to help farmers gain secure rights over currently held land and avoid future land conflict, recommended that Ye farmers’ rights under new land laws be explained to them, asked that help be given to residents to formally register their land, and demanded that rights to registered land be fully respected by the authorities in the face of prospective investment acquisitions. A series of correspondence regarding confiscations by LIB Nos. 343 and 587 in Ayu Taung and Hnin Sone villages provides insight into key difficulties faced by Ye farmers seeking justice for abuses of the past. On 3 October 2012 Mi Myint Than’s letter was met with a response from the Vice Chief Director of the Parliamentary Department who forwarded correspondence obtained in May from the Ministry of Home Affairs and Ministry of Agriculture and Irrigation. The latter detailed that pursuant to Mi Myint Than’s appeal they had dispatched an investigation team in May 2012 to survey the area and consult military authorities. This group was led by the administrator for Ye Township and included the chiefs of the Ye Township and Lamine Sub-township SLRD (accountable for these villages) and the administrator of Lamine Sub-township. Since this ruling, members of Mon State Parliament seem to have endorsed its stance. One interviewee told HURFOM in August that the military decreed that only land outside the 360 acres legally requisitioned by LIB No. 343 would be returned to owners. In the case of Hnin Sone, the Ministry of Home Affairs encouragingly suggested that 35.17 acres of appropriated land that was never used by LIB No. 587 should be returned to previous cultivators, but it failed to condemn initial land seizures. Secondly, land laws offered little protection to farmers seeking land restitution or compensation. The ministries’ failure to condemn past military land confiscations was facilitated by weak land laws that were used to justify (by laws at the time of seizure and at present) land acquisition and failure to pay just compensation. The Ministry of Home Affairs detailed that of 584 acres of land acquired by the two battalions, 458 acres had been registered to owners and 126 acres classified as “vacant or virgin”. Where land had been taken from owners, this was in line with laws allowing the acquisition of land for State purposes and following permissions issued by the Ministry of Home Affairs and Moulmein General Administration Department. Correspondence detailed that compensation totalling 1,882,341 kyat had been paid by LIB No. 343 for 242 acres of land and the crops growing on it. However, this sum represents an average of just 7,778 kyat per acre, and in 2013, land surveyed by HURFOM in Ye Township was valued at an average of 1.7 million kyat per acre (see Appendix 2). The 2012 Farmland Act states that “confiscated farms are to be compensated without any loss,” but it gives no specific guidance as to how this is adjudicated. It is possible that the Home Ministry’s statement here is true, but it is important to recognise that military battalions often failed to keep accurate records of the land being confiscated, underestimating plot sizes in official documentation to avoid being held fully accountable. Nai Aung Soe Myit, 40, from Kyaung Ywa village reported that LIB No. 591 recorded confiscating three acres of his land even though 20 acres were actually seized. Overall, the response to appeals regarding confiscations by LIB Nos. 343 and 587 in Ye Township offered farmers little acknowledgement of or reparation for their considerable losses. In late October Dr. Banyar Aung Moe, AMDP Upper House member, criticised the appeal’s outcome and expressed solidarity with farmers disadvantaged by it. Dr. Banyar Aung Moe recommended that the Land Investigation Commission reassess the case, presumably for a more objective inquiry than government ministries complicit in seizures could offer. Whilst the group has made inquiries in Ye Township their findings have not yet been publicly disclosed. However, given a lack of protections in existing legislation and the fact that the Commission is not afforded decision-making power, its ability to bring about a more favourable outcome is uncertain. Ultimately, decision-making remains centralised among bodies that use subjective, discriminatory laws to evade condemning past military abuses. In addition to government refusal to condemn past abuses and weak protection of farmers’ rights by law, a further obstacle to the progress of Ye Township land disputes is evidenced in the lack of commitment by numerous other bodies to pursue just resolution of appeals. Before land seized by military battalions can be returned to owners, it must first be designated in official records as having been confiscated. Notably, residents complained that members of the Settlement and Land Records Department (SLRD) failed to accurately survey confiscated land. Residents in Kyonepaw village reported concerns about the SLRD’s land survey in their area after they noticed that the group was only measuring confiscated land in active use by the military, not land unused and lying fallow. Similarly, Ye residents described how visiting officials had failed to make adequate efforts to facilitate residents’ input for surveys, typically speaking in Burmese instead of local ethnic languages and using highly technical legal terminology. Much of the misconduct described was alleged to be the result of corruption among government officials whose ties to perpetrators of confiscation yielded vested interests in survey results that favour military retention of land. MP and Land Investigation Commission member Mi Myint Than said that land officials were “biased while conducting the surveys and the outcome looks the same as it did under the military regime.” Members of the Land Investigation Commission confirmed the impact of misconduct in surveys, stating that confiscated land was vastly under-represented in official records. Ye Township residents also stated that after they complained to parliament about unfair land surveys, two chief officers of the Ye Township SLRD submitted letters of resignation and disappeared, reportedly having not been seen since. Locals said the officers’ departure allowed the Department to deny responsibility for survey misconduct and evade questions about the survey’s findings. Mi Myint Than emphasised the need for action on land issues, saying that promotion of personal agendas was not just a problem restricted to government departments. She pointed to political parties who paid lip service to land disputes without showing genuine commitment to pursuing solutions. It is likely that these concerns apply to cases in Ye Township. HURFOM field reporters noted several political parties engaged with victims of land confiscation in Ye, including the Mon Democratic Party (MDP) and Mi Myint Than’s AMDP. Field reporters claimed that the creation of the Land Investigation Commission had given land activists confidence to work with political parties. However, questions were raised about the Mon political parties’ solutions to land confiscation cases, suggesting that promises to fight for farmers’ land were being used to gain political favour and did not represent genuine commitment to pursuing swift and effective action. Whilst several political representatives have been instrumental in advancing the claims of Ye Township’s farmers, there is a need for all parties to follow suit and push for immediate and just outcomes to appeals. As an important actor in national-level policy discussions, the NMSP must ensure that it fully commits to advancing the claims of victims of past military confiscations in Ye Township. Nai Thein, originally from Kaloh village, told HURFOM that the NMSP failed to offer him any assistance when he visited the Ye Township liaison office to discuss his brother’s confiscated plantation. With regards to all parties, HURFOM acknowledges that investigating, adjudicating, and securing justice for land disputes is a challenging task. Our own field reporters noted many obstacles to collecting accurate data on cases (see Methodology). Yet these difficulties are precisely why deep commitment amongst all persons in positions of influence to just resolution of cases is of paramount importance. Anything less represents a sizeable and needless impediment to progress in Mon farmers’ pursuit of their rights to land. 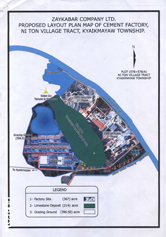 In October 2010 HURFOM published a short report titled ‘Waiting in Tears’ covering Hexa International Company LLC’s plans to establish a large cement production base in Mon State’s Kyaikmayaw Township. The report expressed concerns that land for the project and being designated in SLRD land surveys would be unjustly acquired from residents. Hexa’s plans never materialized, but have since been replaced by numerous other domestic companies competing to capitalise on the township’s hitherto untapped natural resource. To date, HURFOM continues to receive reports of farmers in Kyaikmayaw Township forced off farms and plantations for meagre compensation as these companies seek to acquire the lucrative land. 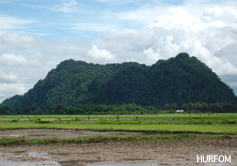 Situated in the east of Mon State and bisected by the Attaran River, Kyaikmayaw Township is straddled by the Ni Don and Pyar Taung Mountains. For residents, these peaks signify the legacy of their ancestors, with caverns and mountaintops strewn with ancient pagodas, cave paintings and religious artefacts. For investors, the mountains’ value lies in the resources lying below these elaborate adornments. A previous employee of the Ministry of Mines estimated that 200 million tonnes of limestone, a vital raw material in cement production, was contained in Ni Don Mountain alone. The mountains also contain a plentiful supply of coal, needed for firing production facilities that convert earth into saleable product. It is reported that plans for heavy cement production in the region began in 2006 with negotiations between Hexa and the ruling Union Solidarity and Development Party (USDP) exploring collaboration and profit-sharing from the enterprise. The project was to cover both Ni Don Mountain on the western side of the Attaran River and Pyar Taung on its eastern bank. Residents in Kyaikmayaw Township first learned of these plans in 2009, not long before government servants, local administration and company officials arrived to survey land in October 2010. However, the following month it was announced that the project had been jointly taken over by the Zaykabar Co. Ltd. and the 24 Hour General Services Co. Ltd. Zaykabar was to extract resources from Ni Don Mountain to the west of the Attaran River and 24 Hour General Services would to set up operations around Pyar Taung Mountain on the eastern bank. Land acquisition began immediately, with 99 farmers signing their plantations over to Zaykabar by the end of December 2010. It has since been reported by Ni Don residents that Zaykabar also acquired around 2,000 of acres of land to construct a road linking future cement supply with nationwide demand. gan at once, with 311.36 acres signed over to the company by the end of February. Two years later, in January 2013, a new company arrived in the area to establish a cement plant on the other side of Pyar Taung Mountain, directly competing with the June Company and compounding pressure on eastern bank residents to sell their land. One resident reported in August that the new arrival, Pacific Link Cement Industries Ltd. led by retired military captain Zaw Lwin Oo, had acquired around 300 acres of land for the project. Research conducted by HURFOM and detailed below demonstrated rife misconduct throughout all companies’ negotiations with Kyaikmayaw farmers. Compensation offers were reported to be far below the land’s market value, companies showed no commitment to seeking free, prior and informed consent from residents in land acquisition (even using threats and deception to gain land), and to date compensation payments have not been received in full by many residents. In total, land acquisition by the Zaykabar, June Industry, and Pacific Link companies is known to have affected 10 villages in Kyaikmayaw Township: Kaw Pa Naw, Kaw Doon, Kwan Ngan, Ka Don Si, Kaw Wan, Kaw Kwee and Sinma villages to the east of the Attaran River and Mae Gro, Ni Don and Pauk Taw to the west. For residents that owned land in multiple locations (in particular farmers from Mae Gro village), there were reports of individual families becoming victims of cement projects on both sides of the river. HURFOM’s research revealed various forms of misconduct, universally perpetrated by all companies active in the area. Almost all residents reported that compensation offered by companies for their land was well below the market price. With land quality varying across the region, HURFOM investigations determined land in Kyaikmayaw Township to be worth between 2.5 to 4 million kyat per acre. In other cases, higher sums were awarded to placate farmers believed to understand their legal rights and who would be willing and unafraid to register complaints. Fuelling allegations that companies were trying to divide farmers, a few residents reported being paid substantially higher sums of compensation. For example, Mi Sone, 48, from Ka Don Si village said that Pacific Link had offered her 2.5 million kyat per acre for her land. HURFOM research also suggested that some farmers secured around 2 million kyat per acre from June Industry. However, these residents were notable exceptions to the general rule. Reportedly not all farmers accepted offers of payment; some residents refused to sign agreements for compensation they perceived to be unfair (see Section D). However, with companies drawing on a variety of strategies to obtain land from residents, many farmers bowed to pressure and relinquished their land for a fraction of its value. Nai Aung Mon, a Mon National School teacher in Kwan Ngan village, described Pacific Link’s attempts to “appease the villagers by providing school materials to children and mosquito nets to families” as a poor substitute for fair compensation. A common threat used by all three companies intimated that farmers’ land was needed for a State-level project, and if farmers did not hand over their land for the compensation offered it would instead be forcibly confiscated for no payment whatsoever. 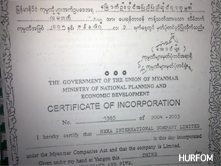 In another case, HURFOM reported in January 2011 that Ni Don village administrator U Kyaw Tun had forged residents’ signatures on land transfer agreements for Zaykabar Co. Ltd. The infringement on residents’ right to consent was most directly the result of corruption in village leadership, but the company persisted in holding the arrangements valid. Similarly, Ma Thin, 36, spoke of how her consent to Pacific Link’s offers was influenced by immediate financial needs. Companies were also alleged to have exploited villagers’ limited knowledge of relevant land laws. For example, the companies’ threats of State land confiscation with zero compensation cannot be upheld by law: the State can forcibly demand use of land, but the 1894 Land Acquisition Act (never repealed under military rule) and the new 2012 Farmland Act clearly state that in such cases, unless the land is unregistered, some compensation must be paid. In a final strike against residents’ informed consent, it was noted that companies did not make due efforts to ensure residents understood the information being conveyed to them. All companies communicated with residents solely in Burmese, and farmers who only speak the ethnic Mon language were unable to understand or negotiate directly with the companies without translators. Several residents told HURFOM that, after signing their consent to land acquisition, they had not been paid in full by June Industry and Pacific Link companies. For example, five Kaw Pa Naw farmers were left uncompensated when Pacific Link paid their compensation sums to various local authority members rather than directly to the plantation owners. The authority figures allegedly claiming compensation included MP U Loon Aung, SLRD member U Hla Myint and Ministry of Home Affairs accountant U San Hlaing. Despite promises of regional development, residents from Mae Gro village commented that in the two years since June Industry arrived, no real signs of progress can be seen. In contrast, concerns about the degradation of Kyaikmayaw’s natural environment resulting from the project have proven legitimate. In September 2013 HURFOM reported that a road recently constructed by June Industry to upgrade infrastructure before cement production begins diverted natural drainage patterns and exacerbated monsoon-season flooding in Ni Don village. 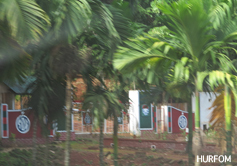 As a result scores of homes and plantations were destroyed. Although HURFOM research did not reveal reasons behind the cessation of their work. One Ni Don resident voiced suspicions that Zaykabar’s disappearance is due to their hands being full elsewhere, alluding to the company’s lawsuit against a political party that supported victims of its activities in Rangoon. Pacific Link Company is rumoured to have suspended its activities during the rainy season but allegedly plans to recommence its project in October of this year, and on-going testimonies that company members continue to proposition farmers for land corroborate reports that the project is still set to go ahead. Since land acquisition for cement production in Kyaikmayaw Township began in 2010, residents have been uniting against companies’ efforts to force them off their land. 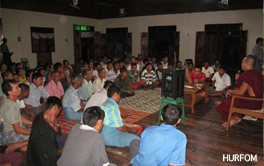 In December 2010, immediately after Zaykabar explained their intentions to Ni Don and Mae Gro residents, villagers held a meeting with local community members who possess some legal and political expertise to encourage informed analysis among participants of Zaykabar’s acquisition plans. More recently residents have become increasingly assertive in their demands, joining the rising tide of civil society action under President Thein Sein’s administration. 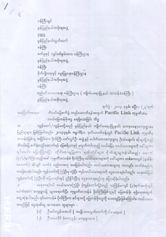 In 2013 residents of Kyaikmayaw Township submitted various letters of appeal. These covered villages throughout the township, although one Kwan Ngan resident noted that residents from his village had yet to join the wave of protest. Results from this investigative team are yet to be seen, but there are some reasons to be cautious about its potential to resolve Kyaikmayaw farmers’ manifold complaints. First, the establishment of the group may serve to postpone government action on the case. One Mae Gro farmer said he was told his case would be discussed by the Mon State government once investigations concluded, and that following this he and other Mae Gro farmers would have to submit another letter of appeal to the central government to prompt a decision. Second, the impartiality of the group is open to debate considering that it is comprised entirely of government servants and local administration members including township administrators, the head of the Kyaikmayaw Department of Forestry, and a representative from the Department of Agriculture and Irrigation. In the wake of a visit from the group, Ka Don Si residents said it was “lucky” that Pacific Link employees now living in the village were not present when the investigative team held discussions with local people because the company staff are thought to have influence over local authorities. The recently formed Land Investigation Committee may better meet the need for an independent body to investigate and adjudicate Kyaikmayaw land disputes. The Committee has already conducted investigations in Kyaikmayaw Township, though their findings are yet to be released. However, the Committee’s responsibilities do not include the decision-making power needed to ensure that complaints are translated into fair outcomes for Kyaikmayaw farmers. The authority to decide land dispute cases still lies with the central government, and with Zaykabar’s chairman an MP for the ruling USDP, it remains to be seen whether justice will prevail for farming families in this much-disputed region. As their cases move forward and decisions start to be made on appeals, the little protection afforded to farmers by current law remains a disquieting part of the process. Under the new 2012 laws, farmers who lack valid documentation for their land are afforded no rights to compensation for land acquired. All Kyaikmayaw farmers in this position, whether current victims of unjust land acquisition or at the mercy of future endeavours, are unsupported by the law when demanding compensation that meets their land’s market value. For example, the reports of Pacific Link targeting unregistered land for seizure raise apprehensions that companies recognise and are capitalising on this legal loophole. Even for Kyaikmayaw farmers possessing ownership documents, their land rights are diluted by the law. Under the Farmland Act, concerns over failure to obtain free, prior and informed consent are legally irrelevant in the case of a State project where farmers may be forced to hand over land against their wishes. If any of the Kyaikmayaw cement production companies are in fact operating with permissions granted to State projects, or if such instances arise in the future, then residents’ consent to land acquisition is not a legal necessity. Furthermore, as outlined in the previous section, the law fails to provide concrete guidance on compensation to victims of State-sanctioned land acquisition. In this way, too much legal leeway is allowed to companies to make their own judgements on fair land values. The one legal protection offered to Kyaikmayaw farmers is found in the 2012 Farmland Act’s requirement that land for State projects must be returned if the project is terminated or not carried out within the prescribed timeframe. However, the lack of transparency surrounding company activities makes it difficult to know where a project stands, whether it is sanctioned by the State, or what timeframe is assigned to it. HURFOM thereby calls for a full investigation of these conditions and, if warranted, the return of residents’ land. Others called for assistance from members of parliament, specifically mentioning MPs Mi Yin Chan (USDP) and Mi Myint Than (AMDP). There is a pressing need for government to publicly acknowledge, condemn, and punish misconduct after remaining silent on the issue and leaving companies in Kyaikmayaw to acquire land as they saw fit. With plans in place for the establishment of enormous-scale cement production in Moulmein Township by the Siam Cement Group, the government must immediately and irrevocably tighten regulations to send a clear message to extractive companies that transgressions in land acquisition are unacceptable. However, the Burmese government is not the only authority that must promulgate messages rejecting unjust land acquisitions. Ethnic armed groups active in Kyaikmayaw share responsibility in this regard. Like in Ye, there is a need for all persons in position of influence, whether local authorities, central government, members of parliament or ethnic armed groups, to stand behind Kyaikmayaw farmers in their battle against unjust land acquisition and fight for reparations for the loss of their livelihoods. Numerous obstacles bar the way for Mon farmers who are actively fighting against unjust land acquisition. This section combines the Ye and Kyaikmayaw township case studies as evidence of key barriers to (1) securing a fully just resolution to past and newly arising land conflicts, and (2) preventing further unjust land acquisition from arising by ensuring secure land rights for farmers. Despite new legislation passed in 2012, the law offers insufficient protection and limited rights over land to farmers facing unjust land acquisition. This is a barrier to farmers claiming legal recourse for land unjustly acquired from them in the past, and also constitutes an obstacle to effective prevention of future injustice. The 2012 Farmland Act offers weak land security for farmers, with forcible acquisition of land for State purposes continuing to be endorsed. This is a concern given that the law lacks guidelines on the circumstances in which this acceptable and the processes by which this may be justly undertaken (see Section C). Legislation does not make due effort to ensure that, in line with international law, State rights to acquire land for public purposes are not abused (See Appendix 1). · In Ye government ministries used the law’s weak land tenure security to vindicate past military seizures of land and avoid satisfying residents’ demands for land restitution or fair compensation. 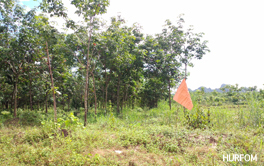 ·In Kyaikmayaw Township threats were made by various investors about forcible land acquisition for “State projects”. Whether or not these were grounded in fact, they had credibility because by law consent need not be sought in such cases. If “State project” claims prove genuine, Kyaikmayaw residents are left with little legal basis for land restitution demands. Whilst by law compensation must be paid, lack of guidelines on this leaves residents without guarantee of payment to the market value of their land. As outlined in Section C, together the 2012 Farmland and VFV laws leave farmers lacking currently valid legal documentation for their land vulnerable to forced acquisition, without consent required or compensation due. In the Mon situation this violates the United Nations Declaration on the Rights of Indigenous People (see Appendix 1), ignoring the right of indigenous people to own land possessed solely by their community’s customary practices. In Ye Township laws allowing State-sanctioned acquisition of formally unregistered land were used by government departments to vindicate past military acquisition of vast swathes of land for zero compensation. As a result residents’ claims for compensation regarding land and destroyed plants were denied. In Kyaikmayaw Pacific Link Co. Ltd. were reported to have in 2013 specifically sought to obtain land in Kwan Ngan village not covered by currently valid LUCs, failing to seek these residents’ consent to sale. Not only does this set a worrying precedent for future land acquisitions, but in the case here farmers have little legal case for land restitution or compensation. In both Ye and Kyaikmayaw townships Mon farmers’ appeals were left to investigation and decision-making by members of government departments and local administration bodies complicit in the very acquisitions in question. Various considerations highlighted the need for an independent body to handle land disputes, both at the stage of investigation and decision-making. In Ye inaccurate surveying of confiscated land by SLRD officials showed that justice for past military confiscations cannot be secured where investigation is delegated to local authorities, as in the context they are not impartial. Similarly, government correspondence regarding appeals suggested bias was also a problem for central government decision-making, with ministries that initially ordered confiscations unsurprisingly endorsing past land acquisitions as legitimate. In Kyaikmayaw investigation into unjust land acquisition by companies was carried out by government servants and local administration members, both widely implicated in collaborating with unscrupulous investors to unfairly force residents off their land. Although results are still unknown, the impartiality of these investigations was dubious. Likewise, at a decision-making level companies’ ties to government made centralised power to adjudicate appeals a concern for future outcomes. With decision-making on land disputes currently centralised, lacking government commitment to endorsing responsible and just land acquisition is brought into focus. State condemnation of and compensation/restitution for unjust land acquisition is a demand of international law (see Appendix 1) and a pre-condition for a government committed to protecting its residents’ rights. However, research showed that the government has consistently failed on this account. In Ye government ministries failed to condemn past military confiscations of land as unjust, instead using weaknesses in law to vindicate these seizures and resist reparations. Even where currently unused land was identified for return to residents, no condemnation was made of the initial seizure. In Kyaikmayaw farmers expressed concern that they had been left unprotected from misconduct by a government that privileged the interests of investors, tolerating and even encouraging unjust acquisition. No clear steps were taken to publicly acknowledge, condemn or punish misconduct by companies active in Kyaikmayaw, nor to regulate their conduct in the first place. Through no fault of their own, many farmers are ill-equipped to secure full satisfaction of their rights in land-related disputes. In on-going cases investors were noted to have specifically taken advantage of this fact to acquire land for prices far below its market value. In both Ye and Kyaikmayaw townships it was observed that residents needed support to fully understand their legal rights regarding their land. In Ye Township a letter of appeal stated that many victims of military confiscation had not known the laws applicable to their case at the time and emphasised that farmers needed training to ensure that they understood the rights held by them under current law. Although (as outlined above) the law offers them weak protection, it is likely that many Ye farmers are yet to comprehend their legal entitlement to fair compensation for State-purpose land acquisition and register demands for it. In Kyaikmayaw investors exploited residents’ lack of legal knowledge to make threats of forcible land acquisition for zero compensation if they refused to comply, on the grounds that the land was needed for a State project. Where land was registered, even if claims of State permission were genuine fair compensation was legally due. However, many residents were unaware of this and gave up their land for a fraction of its market value. In Kyaikmayaw Township a lack of financial knowledge amongst some farmers enabled exploitative investors to successfully make unfairly low offers of compensation. Farmers were seen to have lacked the financial skills needed to successfully negotiate profitable contracts with large-scale companies. 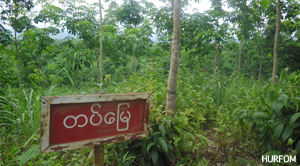 It was also reported that figures involved in land disputes failed to make an effort to facilitate communication directly with residents in their ethnic Mon language, using only Burmese. This meant that for farmers fluent only in Mon, their input on the fate of their land could not be fully registered. In this case the onus is not on farmers, but on relevant bodies to make efforts to involve Mon-speaking staff members in discussions with residents. In Ye Township SLRD members surveying land confiscated by the military communicated with dispossessed farmers only in Burmese, denying them the opportunity to fully state their case. In Kyaikmayaw Township company representatives spoke solely in Burmese to farmers in the course of negotiations. In this way due efforts were not made to seek fully informed consent to land acquisitions. With capacity building a slow process, there is an immediate and pressing need for all persons in position of influence in land dispute cases to effectively advocate for farmers’ rights on their behalf where they cannot fully pursue their own. However, although some positive signs have been seen this is all too absent in the current climate, with farmers often left alone to fight their cases. In Ye Township bias was seen in handling of appeals by the Ministry of Defence, Ministry of Home Affairs and SLRD (see above), all tied to perpetrators of past military abuses. In Kyaikmayaw Township members of the SLRD and local administration were well documented to have collaborated with companies to assist them in acquiring land through unjust means, with allegations of bribery made. To their credit, research indicated various Mon political parties to be involved in supporting farmers’ appeals for justice. In particular, in Ye Township AMDP MPs Dr. Banyar Aung Moe and Mi Myint Than were instrumental in advancing claims lodged by residents against LIB Nos. 343 and 587. However, HURFOM emphasises the need for all Mon political parties to show genuine commitment to farmers’ rights and vocally push for swift and concrete results to appeals. As an influential actor in Mon regions, there is a need for Mon armed groups, and in particular the NMSP, to more visibly commit to advancing the claims of all victims of land-related injustice. Without this, farmers are left unprotected by one of their most influential sources of support and advocacy. The NMSP’s 2012 ceasefire is weak on the promotion of Mon farmers’ rights to land, privileging other concerns. This is particularly relevant to past Ye Township military confiscations, as it is important that reparations for these widespread abuses become a key part of the peace process. The Burmese government has an important responsibility in this regard, with international law requiring that land restitution procedures, institutions and mechanisms be included in peace agreements (see Appendix 1). However, significant efforts are also required by the NMSP to push for this outcome. – To establish clear and just guidelines on State acquisition of land, fully detailing necessary pre-conditions and outlining mechanisms for deciding on fair compensation. – To recognise by law the rights of farmers holding land in accordance with customary law. Failing this, for the government to take efforts to streamline the formal land registration process and support all landholders to obtain LUCs. To appoint an independent and transparent judicial body to investigate and decide on cases of unjust land acquisition. It is suggested that the Land Investigation Commission’s mandate be widened, or for a separate fully impartial body to be created and assigned decision-making powers. – All investigation and decisions made to date must be reassessed by this body, to mitigate the effects of biased appeals handling. – In particular, the government must recognise the demands of international law for the need to, in post-conflict settings, “Establish and support equitable, timely, independent, transparent and non-discriminatory procedures, institutions and mechanisms to assess and enforce housing, land and property restitution claims” (see Appendix 1), bringing about concrete results for farmers in a swift and fully transparent manner. – As a matter of urgency, the Ministry of Defence must ensure that land currently unused by battalions is returned to its former owners immediately. To publicly acknowledge, condemn and punish all cases of misconduct by investors acquiring land in Mon areas. To set a no-tolerance policy for unjust land acquisition by companies and ensure that conduct is more thoroughly regulated in the future. To commit to full transparency in all projects undertaken. In this regard for the Zaykabar Co. Ltd., Pacific Link Cement Industries Ltd. and June Industry Co. Ltd. to disclose whether their projects are in fact genuine State projects, if so detailing (1) Permissions granted to acquire land and (2) Project timeframes listed in permissions. If it should transpire that no State permission was granted, or that projects have been terminated or timeframes exceeded, then in line with Farmland Act (2012) Article 32 land acquired without their free, prior and informed consent must be restored to Kyaikmayaw residents immediately. To eliminate corruption and complicity in unjust land acquisition. Instead showing a commitment to protecting farmers’ rights at all points, whether personnel are involved at the point of land acquisition negotiations or in investigating/adjudicating appeals. To fully cooperate with the Land Investigation Commission’s inquiries and make it clear to local residents that disclosures will not be met with reprisals. To take concrete efforts to enhance farmers’ capacity to handle land disputes. In particular, to offer freely accessible legal counsel and financial skills trainings. To cooperate with investigation of land disputes, providing honest and accurate information. To promote responsible conduct by all foreign investors active in Mon regions, in particular with regards to Siam Cement Group’s plans to establish cement construction in Moulmein, Mon State. The United Nations (UN) Universal Declaration of Human Rights states that “Everyone has the right to own property alone as well as in association with others. No one shall be arbitrarily deprived of his property” (Article 17). The UN Guiding Principles on Internal Displacement asserts, “States have a particular obligation to “protect against the displacement of indigenous peoples, minorities, peasants, pastoralists and other groups with a special dependency on and attachment to their lands” (Principle 9). UN Principles for Housing and Property Restitution for refugees and IDPs (Pinheiro Principles) asserts the right to peaceful enjoyment of possessions (Principle 7). The Pinheiro Principles state that “All refugees and displaced persons have the right to have restored to them any housing, land and/or property of which they were arbitrarily or unlawfully deprived, or to be compensated for any housing, land and/ or property that is factually impossible to restore as determined by an independent, impartial tribunal” (Principle 2) and that “States shall not recognize as valid any housing, land and/or property transaction, including any transfer that was made under duress, or which was otherwise coerced or forced, either directly or indirectly, or which was carried out contrary to international human rights standards” (Principle 15). “Establish and support equitable, timely, independent, transparent and non-discriminatory procedures, institutions and mechanisms to assess and enforce housing, land and property restitution claims” (Principle 12.1). “Take all appropriate administrative, legislative and judicial measures to support and facilitate the housing, land and property restitution process” (Principle 12.3). “Include housing, land and property restitution procedures, institutions and mechanisms in peace agreements and voluntary repatriation agreements” (Principle 12.6). Ensure that “Everyone who has been arbitrarily or unlawfully deprived of housing, land and/or property should be able to submit a claim for restitution and/or compensation to an independent and impartial body, to have a determination made on their claim and to receive notice of such determination. States should not establish any preconditions for filing a restitution claim” (Principle 13). For a detailed history of Burma’s land law see Leckie & Simperingham, Housing, Land and Property Rights in Burma: The Current Legal Framework, 2009. Guidelines for the legal acquisition of land by the State for public purposes are set out in the 1894 Land Acquisition Act. Exempted farmers’ rights to land were conditional on their continuing to use the land for agricultural purposes and refraining from letting it lie fallow. In 1963 Ne Win’s government also passed the Law Safeguarding Peasants Rights, intended to protect indebted farmers from creditors foreclosing on land. However, whilst this prohibits the confiscation of land and property by civil law courts, it makes no pronouncements against State confiscation of land. Constitution of the Socialist Republic of the Union of Burma (1974) Article 18(a); Constitution of the Republic of the Union of Myanmar (2008) Article 37. Cases have been reported of a 99% gap between compensation offered and the market value of land (HURFOM, Laid Waste, 2009, p.38). HURFOM, No Land to Farm, 2003, p.9. Letter from Kayokepi Farmers to the Department of Agriculture and Irrigation, 05/09/11 (Source T2); Letter from Kayokepi farmers to Mon State Parliament, 20/01/12 (Source T1). HURFOM, Field Report (hereafter “FR”) T1, July 2013. 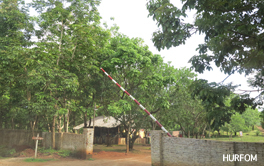 HURFOM, ‘Kaloh village’s appeal for confiscated land remains unresolved’, 28 June 2013. ND-Burma, Report on the Human Rights Situation in Burma April 2012-September 2012, 2012, p.4. ND-Burma, Report on the Human Rights Situation in Burma January 2012-December 2012, 2013, p.1. 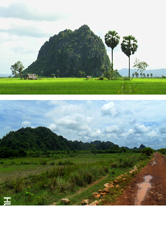 Located in Tenasserim Region, Yebyu Township contains a substantial Mon population. HURFOM, Burma’s Navy Attacks Civilians’ Livelihood, 2011, pp.10-11. 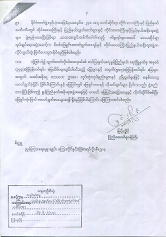 Letter from Secretary Myo Aung Htay to Coastal Region Command, Maw Ra Waddy Navy Department, 24/08/11 (Source YB1). HURFOM, ‘Paung Township residents protest against injustice in their communities’, 5 June 2013. The 1995 ceasefire between the NMSP and Burmese forces broke down in 2010, with a new ceasefire signed in February 2012. HURFOM, ‘Ethnic armed groups also guilty of land confiscation: The case of Kha Yone Guu’, 11 July 2013. Discussion here draws on Food Security Working Group-Land Core Group (FSWG – LCG), ’13 Studies of Land Confiscations in Three Townships in Central Myanmar’, 2012. A recent report by the Karen Human Rights Group (KHRG) detailed land confiscation and obstacles to land use resulting from new resource extraction and development projects in 7 Karen-populated research areas (KHRG, Losing Ground: Land conflicts and collective action in eastern Myanmar, 2013). TNI & BCN, Developing Disparity: Regional Investment in Burma’s Borderlands, 2013, p.2. 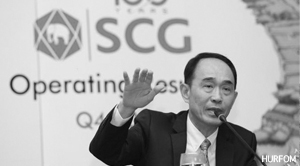 Global Cement, ‘Siam Cement Group spends US$386m on first cement plant in Myanmar’, 4 September 2013. HURFOM Interview O14, September 2013. HURFOM, ‘Land destruction looks set to continue in path of Thanbyuzayat to Three Pagodas Pass road’, 17 June 2013. The following were repealed: Land Nationalisation Act (1953), Disposal of Tenancies Act (1963), Law Safeguarding Peasants’ Rights (1963), Foreign Investment Law (1988). For a more detailed account of laws in effect see FSWG-LCG, Legal Review of Recently Enacted Farmland Law and Vacant, Fallow and Virgin Lands Management Law, 2012. For example, it is common in Mon areas to consider land to be owned by the first person to cultivate on it. This practice is known in Burmese as dama ucha, or “wields the machete” (FSWG-LCG, 13 Studies of Land Confiscations in Three Townships in Central Myanmar, 2012, p.15). See for example the US Constitution’s Fifth Amendment and the UK Acquisition of Land Act (1981). See also the UN Pinheiro Principles. Displacement Solutions, Bridging the HLP Gap, June 2013, p.27. See for example, FSWG-LCG, Legal Review of Recently Enacted Farmland Law and Vacant, Fallow and Virgin Lands Management Law, 2012, p.26. ND-Burma, Report on the Human Rights Situation in Burma April-September 2012, 2012, p.1. For some recent cases see: Mizzima, ‘Land loss resident in Dawei to sue ITD’, 24 June 2013; Irrawaddy, ‘Farmers across Burma ask Thein Sein for help’, 27 June 2013; Myanmar Eleven, ‘Hundreds gather in protest against seized lands in Yangon, 27 July 2013; Mizzima, ’24 villages threaten protest’, 31 August 2013; Myanmar Eleven, ‘Farmers protest against land grabbing in Bago region’, 2 September 2013. For example of new freedoms granted, see the December 2011 Peaceful Protest Law and relaxation of press censorship restrictions in August 2012. In September 2012 Myanmar Eleven reported that the recently established Human Rights Commission was receiving around 30 letters of complaint daily, with most of them related to land disputes. For a detailed account of farmers taking collective action in Karen regions see KHRG, Losing Ground: Land Conflicts and collective action in eastern Myanmar, 2013. HURFOM Interviews Y5-6 & Y9 (Ye Township), Y10 (Koe Mile), Y11 (Kundu), Y14 (Kan Hla), Ye Township, July-August 2013; HURFOM Interviews K1-3 & K9 (Mae Gro village), K13 (Ka Don Si village), Kyaikmayaw Township, April-August 2013. HURFOM Interview K9, Mae Gro village, Kyaikmayaw Township, August 2013. HURFOM Interview Y5, Ye Township, July 2013; HURFOM Interviews K2-3 (Mae Gro village), K13 (Ka Don Si village), Kyaikmayaw Township, April-August 2013. HURFOM Interview Y13, Kyaung Ywa village, Ye Township, August 2013. Appeals in Ye Township: HURFOM Interview Y1 Kaloh village, Ye Township, July 2013; HURFOM FR Y2, Ye Township, September 2013 (mention of appeals against in Koe Mile, Kamarwat and Kundu villages); HURFOM, ‘Kaloh village’s appeal for confiscated land remains unresolved’, 28 June 2013; Correspondence from government departments and Dr. Banyar Aung Moe regarding appeals for land confiscated by LIB Nos.587 & 343 in Hnin Sone and Ayu Taung villages May-October 2012 (Sources Y1-4). Appeals in Kyaikmayaw Township: HURFOM Interviews K1, K2, K3, K4, K9, Mae Gro village, April-August 201; HURFOM Interview K7, Kwan Ngan village, August 2013; HURFOM Interviews K12, K13, K14, Ka Don Si village, August 2013; HURFOM FR K2, Kyaikmayaw Township, August 2013 (mention of appeals in Kwan Ngan village); Letter from Mae Gro village farmers to the Land Investigation Commission, regarding land unjustly acquired by June Industry Co. Ltd. 22/04/13 (Source K1); Letter from Kaw Pa Naw village farmers to various areas of government and parliament regarding Pacific Link compensation dispute 23/04/13 (Source K2); Letter from Pyar Taung and Natural Environment Watch Network (Kaw Pa Naw, Kaw Doon, Mae Gro, Kwan Ngan, Ni Don, Ka Don Si, Pauk Taw, and Kaw Wan villages) regarding June Industry Co. Ltd. and Zaykabar company cement projects 27/06/13 (Source K3); HURFOM, ‘Ethnic armed groups also guilty of land confiscation: The case of Kha Yone Guu’, 11 July 2013. 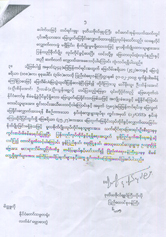 Appeals in Thanbyuzayat Township: HURFOM FR T1, July 2013 (mentions appeals in Kayokepi, Waekalaung, Kyaung Ywa and Wae Win Karaw villages); Letters from Kraitpi village farmers to Mon State government & Ministry of Agriculture and Irrigation regarding land confiscation by village administration, September 2011-January 2012 (Sources T1-2). Appeals in Yebyu Township: Response to appeals by Secretary Myo Aung Htay on behalf of the President regarding by land confiscated by Navy No. 43 in Kywe Thone Nyi Ma village, 24/08/11(Source YB1). Appeals in other areas of Tenasserim Region: HURFOM, ‘Owner watches confiscated farmland sell for housing’ (Kaw Taung village), 5 October 2012. HURFOM Interview K4, Mae Gro village, Kyaikmayaw Township, April 2013. HURFOM Interview Y1, Kaloh village, Ye Township, July 2013. HURFOM, ‘Land tax controversy between Ye residents and military battalion’, 20 June 2013. HURFOM Interviews K1 (Mae Gro village), K7 (Kwan Ngan village), K8 (Kaw Pa Naw village), K10-11 (Ka Don Si village), Kyaikmayaw Township, April-August 2013. HURFOM Interview K1, Mae Gro village, Kyaikmayaw Township, April 2013. HURFOM, Interview K14, Ka Don Si village, Kyaikmayaw Township, August 2013. 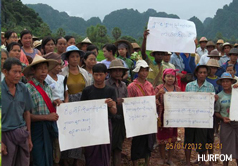 HURFOM, ‘Farmers in Mon State urge formation of a Farmers’ Union’, 18 September 2012. Transnational Institute, Access Denied, May 2013, p.8. See 2012 Farmland Act, Article 38. HURFOM Interview O13, September 2013. Myanmar Times, ‘Reps ignore ministry on land-grab committee’, 5 August 2013. HURFOM Interview O12, July 2013. Irrawaddy, ‘Land grab probe travels across Burma’, 26 September 2012. HURFOM Interview O1, July 2013. Mizzima, ‘Land grab commission opens inquiries in Mon State’, 12 June 2013. 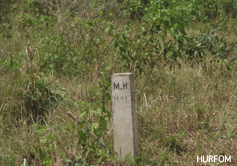 Failure by military authorities to cooperate with investigations has been reported by other Commission investigation groups (Mizzima, ‘Seized land commission facing problems during investigations’, 7 September 2013). HURFOM Interview O2, July 2013. One commission member was reported as claiming that military abuses were being tackled first as these cases were less complex and data more complete (Irrawaddy, ‘Military involved in massive land grabs’, 5 March 2013). Irrawaddy, ‘Military involved in massive land grabs’, 5 March 2013. Irrawaddy, ‘Only fraction of land will be returned: Minister’, 18 July 2013. DVB, ‘Military agree to return meagre fraction of land confiscated by military’, 18 July 2013. Mizzima, ‘Restoration of land seized too slow, too less: Inquiry Commission’, 28 August 2013; Myanmar Eleven ‘Parliament speaker calls for quick return of seized land’, 1 September 2013. Irrawaddy, ‘Military to return some confiscated land soon: MP’, 8 July 2013; Mizzima, ‘Seized lands to be returned’, 26 August 2013. DVB, ‘Ministry agrees to return meagre fraction of land confiscated by military’, 18 July 2013. DVB, ‘Move to aid farmers may devastate sector’, 4 August 2013. See, for example, DVB, ‘Farmers in hiding near Inle Lake as officials crack down on ‘plough protests’, 12 June 2013; Irrawaddy, ‘Activist Naw Ohn Hla Jailed 2 Years for Letpadaung Protest’, 29 August 2013; Irrawaddy, ‘Land Rights Activists Sued for Protesting Without Permission’, 8 May 2013. HURFOM Interview O7, email correspondence, June 2013. Recent reports include: HURFOM FR Y2, September 2013; Correspondence from government departments and Dr. Banyar Aung Moeregarding appeals for land confiscated by LIB Nos.587 & 343 in Hnine Zone and Ayu Taung villages (Sources Y1-4), May-October 2012; HURFOM news archives (available online). See also Appendix 2 of this report. Reports regarding military land confiscation received from: Kamarwat, Kalaw Lay, Kyaung Ywa, Cha Pone, Ah Mae, Koe Mile, Kundu, Kan Hla, Kaw Hlaing, Kaloh, Kyone Paw, Hangan, Lein Maw Chan, Ayu Taung, Kyaung Ywa, Kaw Palaing, Khaw Zar, Don Phi, Phar Lane, Mawkanin, Taungbon, Hangan, San Pya, Duya, Abaw, Tu Myaung, Thar Ga Yan, Sonnatha, Gukataw, Kalar Gote island. In addition Hnin Sone and Lamine sub-townships. Perpetrators known to HURFOM: LIB Nos. 106, 282, 299, 317, 343, 538, 583, 585, 586, 587, 588, 591; IB Nos. 31 & 61; AR Nos. 311 & 317; MOMC No. 19; Navy Unit No. 43. HURFOM FR Y1, Ye Township, July 2013; Letter from the Ministry of Agriculture and Irrigation regarding land confiscation by LIB 587 & 343 in Hnin Sone and Ayu Taung villages (Source Y2), 18/04/12. 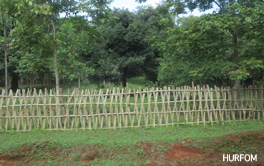 For example land in Koe Mile village confiscated in 2001 for use by the Ministry of Environmental Conservation and Forestry (HURFOM Interview Y10, Koe Mile village, Ye Township, August 2013; HURFOM FR Y2, September 2013). 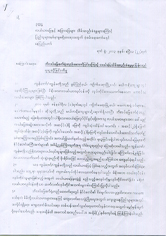 Letter from the Ministry of Agriculture and Irrigation to the President and Union government regarding land confiscation by LIB 587 & 343 in Hnin Sone and Ayu Taung villages (Source Y2), 18/04/12. HURFOM Interview Y10, Koe Mile village, Ye Township, August 2013. Villages surveyed were: Kyonepaw, Koe Mile, Kyaung Ywa, Kan Hla, Kundu, Ayu Taung, Phar Lane, Duya, Gukataw, Thar Ga Yan, Kaloh, Hangan, Kaw Hlaing and Mawkanin villages. Residents in Kaloh, Hangan and Kaw Hlang villages were notably suspicious of and uncooperative with HURFOM reporters. This problem was possibly exacerbated by the fact that security concerns rendered HURFOM reporters unable to visit these villages in person and interviews had to be conducted via telephone. In Ayu Taung and Mawkanin villages data was difficult to confirm due to migration of many victims to different areas. HURFOM FR Y2, September 2013. Letter of appeal by Ye Township residents, 13/05/12 (Source Y5). Letter from Ministry of Agriculture & Irrigation regarding confiscation by LIB No. 343 in Ayu Taung village (Source Y2), 18/04/12; Letter from Ministry of Home Affairs regarding confiscation by LIB No. 343 in Ayu Taung village, 13/04/12 (Source Y3); HURFOM Interviews Y2, Y4, Y9, Y12, Y13, Y14, July-August 2013 (mention payment-free lease in Hangan, Kundu, Kwan Bae and Kan Hla villages); HURFOM FR Y2, September 2013 (mentions payment-free lease in Ayu Taung, Koe Mile, Kundu and Kyonepaw villages). HURFOM Interview Y9, Ye Township, August 2013. HURFOM Interview Y3, Ye Township, July 2013; HURFOM Interview Y9, Ye Township, August 2013. HURFOM Interview Y5, Ye Township, July 2013. HURFOM Interview Y8, Kyonepaw village, August 2013. HURFOM Interview Y14, Kan Hla village, August 2013; HURFOM Interviews Y2-5, Y7 & Y9, Ye Township, July-August 2013 (Y3, Y5, and Y9 were still renting land). HURFOM Interviews Y4 & Y6, Ye Township July 2013; HURFOM FR Y2, September 2013. HURDOM Interview Y8, Kyonepaw village, August 2013. HURFOM, Interview Y9, Ye Township, August 2013. HURFOM Interview Y11, Kundu village, August 2013. HURFOM Interview Y7, Ye Township, July 2013. HURFOM Interviews Y11 (Kundu), Y13 (Kyaung Ywa), K14 (Kan Hla), August 2013. HURFOM, ‘Ye Township Residents Recount Trials of Land Disputes with Military’, 16 September 2013. 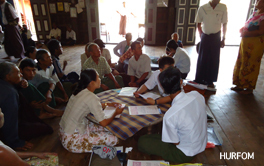 HURFOM Interviews Y8 (Kyonepaw), Y11-12 (Kundu), Y13 (Kyaung Ywa), August 2013. HURFOM Interviews Y8 (Kyonepaw), Y11-12 (Kundu), August 2013. HURFOM Interview Y13, Kyaung Ywa village, August 2013. HURFOM Interviews Y8 (Kundu), Y11 (Kyonepaw), Y13 (Kyaung ywa), August 2013; HURFOM Filed Report Y2 (section on Kyonepaw), September 2013. HURFOM Interview Y12, Kundu village, August 2013; HURFOM Interview Y14, Kan Hla village, August 2013. HURFOM FR Y2 (comment on Koe Mile village), September 2013; HURFOM Interview Y11, Kundu village, August 2013. HURFOM Interview Y4, Ye Township, July 2013. HURFOM FR Y2, September 2013; HURFOM Interview Y4, July 2013; HURFOM Interview Y11, Kundu village, Ye Township, August 2013; HURFOM, Destination Unknown: Hope and doubt regarding IDP resettlement in Mon State, October 2013, pp.39-40. HURFOM Interview Y6, Ye Township, July 2013; HURFOM Interview Y14, Kan Hla village, August 2013. HURFOM Interview Y14, Kan Hla village, August 2013. HURFOM, ‘Villagers slowly return to former communities in search of confiscated land’, 18 December 2012. For example, HURFOM FR Y2, September 2013 notes that at the time of seizure some residents in Koe Mile successfully resisted confiscation of land by the Ministry of Environmental Conservation and Forestry, who withdrew from some areas of land subsequent to a letter of appeal submitted by residents. Appeals have been made known to HURFOM in: Koe Mile, Kamarwat and Kundu (HURFOM FR Y2, September 2013); Hnin Sone and Ayu Taung (Correspondence from various government departments and MP Dr. Banyar Aung Moe, Sources Y1-4, May-October 2012). HURFOM Interview Y10, Koe Mile village, August 2013. Letter from Tin Win Aung, Vice Chief Director of the Parliamentary Department on the behalf of the Chief Director, to Mi Myint Than, 03/10/12 (Source Y1). Letter from Myin Hlaing, Ministry of Agriculture and Irrigation to the President and Union government, 18/05/12 (Source Y2). HURFOM Interview Y12, Kundu village, August 2013. Letter from Lieutenant General Ko Ko, Ministry of Home Affairs to the Union government, 13/05/12 (Source Y3). At the time of both letters the 2012 Farmland Act had been passed, however it had yet to be enacted. Whilst ministries are likely to have been applying previous legislation to the case, as detailed here the Farmland Act offers no new protection and confers similar rights to the State to acquire land. Farmland Act (2012), Article 26. Letter from Dr. Banyar Aung Moe, 29/10/12 (Source Y4). HURFOM, FR Y2, September 2013. HURFOM, ‘Ye Township residents appeal to parliament to resolve sluggish land disputes’, 5 September 2013. Displacement Solutions, Bridging the HLP Gap, June 2013, p.24. HURFOM Interview Y15, September 2013. HURFOM, ‘Waiting in Tears: Impacts of impending cement factory development in Kyaikmayaw Township’, 20 October 2010. HURFOM Interview K1 (Mae Gro village, April 2013) mentions awareness in 2009 of the project. Mention of 2010 land survey in HURFOM, ‘Waiting in Tears: Impacts of impending cement factory development in Kyaikmayaw Township’, 20 October 2010. HURFOM, ‘Rock sampling for coal plan spreads fears of land confiscation in Kyaikmayaw Township’, 28 January 2011. HURFOM Interviews K5 & K5, Ni Don village, July 2013. Letter from Mae Gro village farmers to Land Investigation Commission, 22/04/13 (Source K1). HURFOM Interviews K1-15, April-August 2013; HURFOM FRs K1-3, May-September 2013; Letters of appeal from Mae Gro farmers, Kaw Pa Naw farmers and Pyar Taung and Natural Environment Watch Network, April-June 2013 (Sources K1-3). For example, HURFOM Interview K1, Mae Gro village, April 1013. Market value determined from interviews with Kyaikmayaw victims of unjust land acquisition, in addition to consultation with Mon State land and property broker. HURFOM, ‘’When I became desperate’: Opinions of residents during forced land acquisition in Kyaikmayaw Township’, 18 January 2011. HURFOM Interview K1, Mae Gro village, April 2013; Letter from Mae Gro farmers to Land Investigation Commission, 22/04/13 (Source K1); HURFOM FR K2, August 2013. HURFOM Interview K7, Kwan Ngan village, August 2013; HURFOM Interview K10, Ka Don Si village, August 2013; HURFOM Interview K14, Ka Don Si village, August 2013; Letter from Kaw Pa Naw residents to various government departments, 23/04/2013 (Source K2). HURFOM, ‘Farmers describe discrimination and corruption in land compensation schemes – exploitation/authorities’, 19 August 2013. HURFOM Interview K11, Ka Don Si village, August 2013. HURFOM Interviews K1 (Mae Gro village), K7 (Kwan Ngan village), K8 (Kaw Pa Naw village), K10-K11 & K14 (Ka Don Si village), Kyaikmayaw Township, April-August 2013. HURFOM Interview K5, Ni Don village, July 2013. HURFOM Interviews K1, K3-4, K9, Mae Gro village, April-August 2013 (regarding June Industry); HURFOM Interview K5, Ni Don village, July 2013 (regarding Zaykabar); HURFOM Interviews K10 & K15, Ka Don Si village, August 2013 (regarding Pacific Link); Letter from Pyar Taung and Natural Environment Watch Network to the President regarding Pacific Link, 27/06/13 (Source K3). HURFOM Interview K10, Ka Don Si village, August 2013. HURFOM Interviews Nos. K1-4 & K9, Mae Gro village, April-August 2013 (regarding June Industry); Letter from Mae Gro farmers to Land Investigation Commission regarding June Industry, 27/04/13 (Source K1); HURFOM, ‘When I became desperate’, 18 January 2011 (regarding Zaykabar); Letter from Pyar Taung and Natural Environment Watch Network to the President regarding Pacific Link, 27/06/13 (Source K3). HURFOM Interview K9, Mae Gro village, August 2013. HURFOM Interviews K1-4 & K9, Mae Gro village, April-August 2013 (regarding June Industry); HURFOM Interview K5, Ni Don village, July 2013 (regarding Zaykabar); HURFOM Interviews K7, Kwan Ngan village, August 2013 (regarding Pacific Link); Letter from Pyar Taung and Natural Environment Watch Network to the President regarding Pacific Link, 27/06/13 (Source K3). HURFOM Interview K3, Mae Gro village, April 2013. HURFOM Interview K14, Ka Don Si village, August 2013. HURFOM, ‘Kyaikmayaw Township landowners complain after village head illegally sells land to Zaykabar Company’, 25 January 20133. 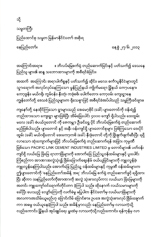 Letter from Pyar Taung and Natural Environment Watch Network to the President regarding Pacific Link, 27/06/13 (Source K3). HURFOM Interview K15, Ka Don Si village, August 2013. The Land Acquisition Act (1894) Article 5; Farmland Act (2012), Article 26. Letter from Mae Gro farmers to Land Investigation Commission, 22/04/13 (Source K1). HURFOM Interview K4, Mae Gro village, April 2013. HURFOM Interview K6, Ni Don village, July 2013. HURFOM Interview K12-13, Ka Don Si village, August 2013. HURFOM Interview K12, Ka Don Si village, August 2013. HURFOM, ‘When I became desperate’, 18 January 2011 (regarding Zaykabar); HURFOM, ‘Farmers describe discrimination and corruption in land compensation schemes’, 18 January 2011 (regarding Pacific Link and June Industry). HURFOM Interview K2, Mae Gro village, April 2013; HURFOM Interview K11, Ka Don Si village, August 2013. Letter from Kaw Pa Naw farmers to government departments, 23/04/13 (Source K2). HURFOM Interview K13, Ka Don Si village, August 2013. HURFOM Interview K2, Mae Gro village, 2013. Concerns about natural environment and wildlife voiced in letter from Pyar Taung and Natural Environment Watch Network to the President, 27/06/13 (Source K3). HURFOM, ‘Labor migration leaves women and children to face flooding in Mon State’, 5 September 2013. HURFOM Interview K2, Mae Gro village, April 2013. Letter from Pyar Taung and Natural Environment Watch Network to the President, 27/06/13 (Source K3). Irrawaddy, ‘Zay Kabar Launches Defamation Lawsuit’, 23 July 2012. HURFOM Interview K8, Kaw Pa Naw village, August 2013. HURFOM Interview K7, Kwan Ngan village, August 2013; HURFOM Interview K10, Ka Don Si village, August 2013. HURFOM Interview K4, Mae Gro village, April 2013; HURFOM Interview K6, Ni Don village, July 2013. HURFOM Interview K7, Kwan Ngan village, August 2013. In a similar vein, a Ka Don Si village farmer noted that some farmers in her village were satisfied with their compensation and were not participating in attempts to register unjustly acquired farmland (HURFOM Interview K10, Ka Don Si village, August 2013). HURFOM Interview K9, Mae Gro village, August 2013; Letter from Pyar Taung and Natural Environment Watch Network to the President, 27/06/13 (Source K3). Farmland Act (2012), Article 32. HURFOM Interview No, K1, Mae Gro village, April 2013. See also HURFOM Interview K4, Mae Gro village, April 2013. HURFOM Interviews K2 & K4, Mae Gro village, April 2013. HURFOM Interview K1, Mae Gro village, April 2013. TNI, Access Denied, 2013, p.3. 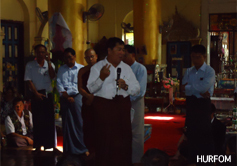 See Displacement Solutions’ recommendation in ‘Myanmar at the HMP Crossroads’ of the pressing need for Burma’s government to make strong political pronouncements against “HLP misdeeds” (June 2012). Although Principle 21.1 states that compensation may be paid in lieu of restitution if voluntarily accepted by the injured party.